Custom-designed and custom-built by industry experts with ideal tube matching in mind. We match tubes more closely and more accurately than you'll find anywhere else. Our custom-designed hardware and software developed in-house allow us to match tubes to our exact specifications and criteria. Unlike currently available matching systems, our system allows for very small measurements of current, allowing our matching system to be extremely accurate compared to common matching methods. Our multiple matching measurements are taken after pre-defined warm-up periods and are taken using current-stabilization techniques to ensure that results are precise and repeatable. Our tube-matching system is largely automated and computer-controlled, eliminating the potential for human error and allowing for high-quality results. Apex Matching® is a complex multi-step process designed to ensure that you get the highest-quality matched tubes available. We perform extensive testing and analysis on each tube that runs through our system to provide an incredibly accurate and precision-matched tube set. Discover our process for matching tubes. Power tubes are electrically matched so each tube will have essentially the same amount of idle plate current and amplification characteristics when used in an amplifier. This is done to optimize the efficiency and longevity of the tubes and to provide the best sound possible from your amp. 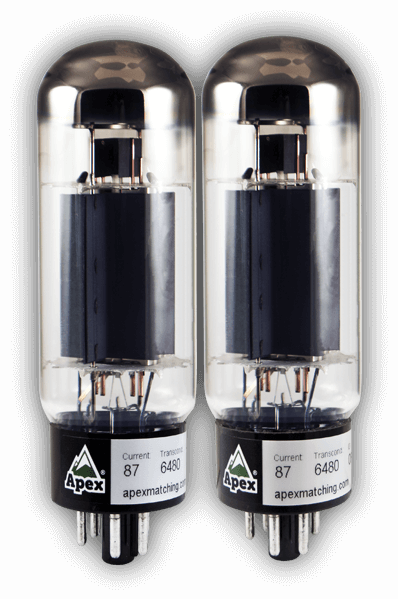 When it’s time to replace your Apex® Matched tubes, you can request a replacement set with similar matching characteristics to eliminate the need for a bias adjustment on the amp. Matching also provides an additional quality check to help reduce the possibility of receiving a faulty power tube that may have slipped by the manufacturer. Click below to find out more about why you should match your tubes! Many of our power tubes are available burned-in prior to our Apex® matching process. Burning in tubes helps to stabilize the tubes for maximize performance. The Apex® method yields superior results over other systems that simply burn-in their tubes overnight with a low operational plate current that varies from tube to tube. Click below to find out more.